As we know, coding has become relevant in almost every industry, so giving nieces and nephews more opportunity to learn to code, and practice their coding skills, is one of the best gifts we can offer. 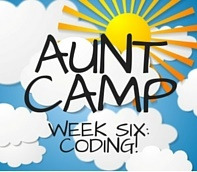 While there are many websites and apps that can help kids code, we’ve curated our favorites for this week’s AUNT CAMP. Ages 3-6: The Fisher-Price Thing & Learn Code-a-Pillar won a Savvy Auntie Coolest Toy Award - Toy Fair 2016. The adorable toy helps young children develop their problem solving, planning and sequencing, and critical thinking skills. Plus, there are endless coding combinations for their Code-a-Pillar.. After coding, go outside and find some real caterpillars! Age 7: Daisy the Dinosaur is a simple game for your younger nieces and nephews. The adorable dinosaur teaches kids programming concepts without using complex terminology. Children drag and drop commands, and click drop down menus, to choose when Daisy should do something and in what direction she should move. This is a great way to get a little one started. Age 8: In Cato’s Hike: A Programming and Logic Odyssey, nieces and nephews go on an adventure with Cato, a little boy who walked into a portal to another world. He can only move by writing a program for himself. There are 60 levels and 12 tutorials so the kids can learn more about Cato as they learn about programming. Age 9: In the app Tynker, kids use programming to solve puzzles, build games, and create animations. When your niece or nephew gets really good at it, you can go to the website and gift them with an online course. Do it soon, because Tynker is providing a discount for this summer. Age 10: The little computer whiz can drag and drop commands and instructions in Hopscotch. Kids choose the characters they prefer and tell those characters what to do. An added plus is that the makers encourage safety with online usage. For example, this app reminds users not to use their real names when sharing what they’ve created. Age 11: Cargo-Bot is great because previous students of Codea (an app that teaches and allows players of all ages to practice coding) created it. In Cargo-Bot, your nieces and nephews will direct a robot arm to move crates of coding into the right spots. One of the most important lessons they learn is how to optimize the codes for length and function. When they are done, they can share what they’ve created on Youtube. Ages 12+: Your teenage nieces and nephews can start using real coding programs in Codecademy. The app provides examples of lines of code to get them started. Once they have the hang of it, they can play “Code Hour” for regulated lessons so that they can practice daily. Check out Codecademy’swebsite to learn more. Added Bonus: Is there anything Google doesn’t do? Google created CS First to teach students ages 9-14 coding by teaching them to create real projects that adults work on everyday. Lessons involve storytelling, fashion, design, art, social media, and video games. They can make a music video or design a bracelet that Google sends back to them. CS First typically runs through volunteer clubs, so you may be able to help encourage the school boards of your nieces and nephews to start one up. Coding is not just for kids. Many websites like Treehouse (discussed in another article) teach adults how to code. And now, you can code along with your nieces and nephews! Home Activities AUNT CAMP 6: Coding!